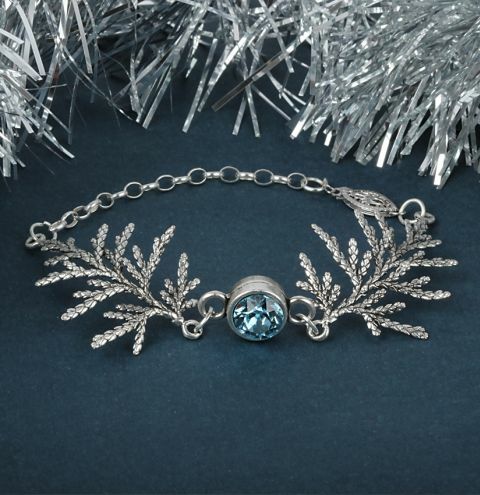 Learn how to make a Frozen Winter Bracelet with new evergreen leaf connectors and touch of Swarovski for that winter sparkle! Open a pair of jumprings and connect one side of the chain to the clasp. Connect the other side to a leaf connector. Connect the other end of the leaf charm to the setting. Attach the opposite side of the setting to a second leaf connector with a jumpring. Finish the bracelet by connecting the leaf charm to the clasp with a jumpring. Glue in your Swarovski crystal and allow to dry before wearing your bracelet. You may like to carefully bend the charms a little to give the design some curvature.